Catch him if you can. The Fugitive is on the run! Harrison Ford and Tommy Lee Jones race through the breathless manhunt movie based on the classic TV series. 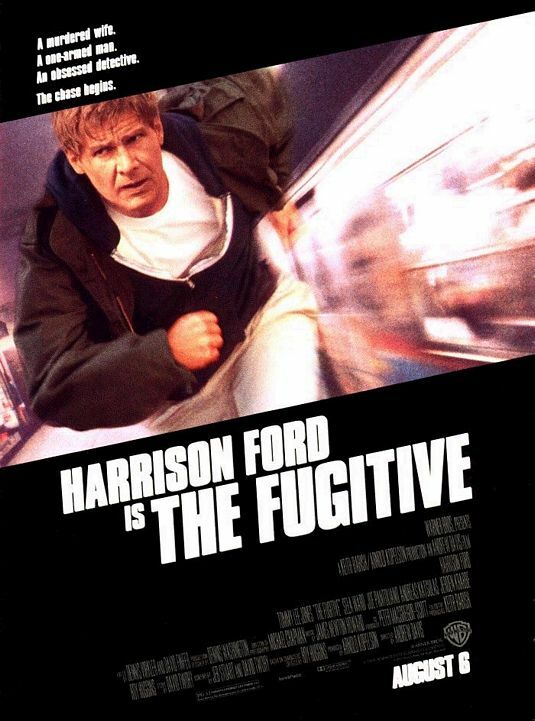 Ford is prison escapee Dr. Richard Kimble, a Chicago surgeon falsely convicted of killing his wife and determined to prove his innocence by leading his pursuers to the one-armed man who actually committed the crime. Jones (1993 Academy Award and Golden Globe winner as Best Supporting Actor) is Sam Gerard, an unrelenting bloodhound of a U.S. Marshal. They are hunted and hunter. And as directed by Andrew Davis (Under Siege), their nonstop chase has one exhilarating speed: all-out. So catch him if you can. And catch an 11-on-a-scale-of-10 train wreck (yes, the train is real), a plunge down a waterfall, a cat-and-mouse jaunt through a Chicago St. Patrick's Day parade and much more. Better hurry. Kimble doesn't stay in one place very long!